The first bit of the movie shuffles along. Ravi is a faceless constituent of the vast populace, a doting father and husband, and a diligent worker. This ordinary existence is savagely disrupted when his young son flounders and falls on the cricket greens. Gaurav (Yash Pathak) needs a miraculous heart transplant, and his father, fifteen lakhs for this imminent miracle. The image of his limp son, in a hospital bed, floods Ravi with poignant memories of a happy past. These snapshots of domestic bliss are starkly juxtaposed with the numb indifference of insurance officers and factory bosses. The wretched father goes up every alley (even the shady ones), but every effort crumples into a futile "no". Meanwhile, screechy Sarita (Amisha Patel) is insistently trying to play the aching mother. Her unceremonious wailing does little for her piddly performance. And what's with that perpetual clownish mouth-wide-open look? One fears her ever-widening grin will outrun her face. Both father and son are battling against their respective deadlines. Ravi has only a single night left in which to gather the ominous amount. Politics stealthily creep in when another (more powerful) contender, Swamiji (ruling party leader), bids for the same heart reserved for Gaurav. The fifteen lakhs remain elusive, Ravi is at his wit's end, and his wife is breaking all records of screechiness. Enter Sanjay Dutt in his pet mode - time for some gung-ho action, my friend. Armed with a gun, Ravi takes thirty people hostage in the waiting room of the hospital. Instantly the cops (surprise, surprise - on time! ), the crowds (they're always on time) and the cameras (they're before time) flock the hospital grounds. The ruthless DCP (Gulshan Grover) is a no-negotiator, and his squad of snipers have their aim set - gun down the criminal. Tathastu attempts to tickle a prickly issue. High-end healthcare is inaccessible to the majority, and this is the brutal truth. How does a man earning a measly Rs. 5,000 muster a massive Rs. 15 lakhs? Does he hold up a hospital waiting room? Inside the waiting room, bizarre things happen. A woman gives birth to her first child, a domestic violence victim thrashes her husband, a stock broker realizes that money is bogus, and a prostitute claims Ravi is the "asli hero". The hostages cosy up to Ravi, "their hero". He, like the Almighty, juggles their woes and sets them right. These interactions could have been intense but end up being a charade. The characters are tacky and they indulge in priggish moralizing. No good. There's no Sanjay-Special bruise 'n' bumps kind of action - only Gulshan Grover gets socked by Sanjay Dutt. It's the climax that is this movie's crowning fall. 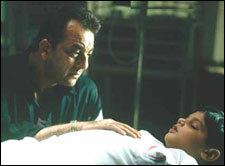 With a gun to his head, Ravi decides to lend his own heart to his dying son. But just as the hysteria is reaching its peak and the trigger its target, along comes the crafty Mantriji who offers to give back the miracle heart (their party will collect a whole extra load of precious votes!). Phew! Tathastu's storyline deserves to be chucked in the bin. And so does the manner of narrating it. Sanjay Dutt varies from maddened to mediocre. The rest are either trivial or barren performances. The kid's got cute, plump cheeks. Like an irksome bee sting that smarts for a short while, this film will remain nothing but a bad two hours, by the end of this day. fullhyd.com has 700,000+ monthly visits. Tell Hyderabad what you feel about Tathastu!